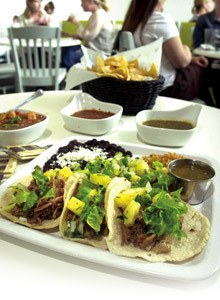 Zocalo Café is our own little piece of Mexico City centrally located in charming Clarksville. The restaurant’s bright garden patio covered in native succulents is a perfect spot to sip frozen sangria with neighbors and friends. Zocalo offers fare that is as deliberately light as the minimalist décor, making it a far cry from Austin’s typical Tex Mex. Our menu is a fresh take on interior Mexican cuisine that is as easy on your wallet as it is on your figure. 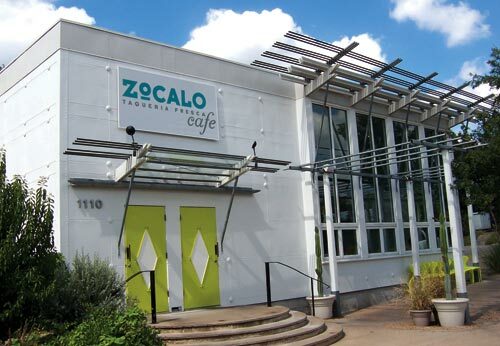 Owners of Zocalo Café have taken great initiative in ensuring the restaurant stay deeply rooted in the community – starting with the name, which translates as “townsquare” or “meeting place”. While dining you may discover your new favorite local artist – Zocalo showcases art and photography from local up and coming artists. Zocalo remains environmentally friendly through participation in a locally run recycling program, one of only a handful of restaurants that participate in the program, and also uses all biodegradable and compostable to-go packaging materials. Locally owned and operated by Chris Courtney, Kelly Chappell, and Jay Bunda.